After you adjust the height of your office chair, the seat depth is next. Getting the right height adjustment will set your hips and low back in as healthy a position as possible for the activity of sitting. (Did I tell you sitting is one of the worst things for your back? It is. How sad for our spines that so many of us spend most of our days this way!) The hip position you establish when you get the height adjustment right provides a starting point for all the other chair adjustments. Once you’ve got the height so that it fits with your frame, the next adjustment to make is the seat depth. When made correctly, the seat depth adjustment enables you to access support from the chair back without cutting off circulation at your knees. Seat depth measurement is about how far forward your body is - an ideal seat depth is one that positions you with as much comfort and support as the chair can give. With the chair supporting you properly, your body does not need to work as hard to keep you upright. If the seat pan, as it’s often called, is too far forward, it may put undue pressure at the backs of your knees. Try to position the seat so it ends a little higher up your thigh. Also when you purchase your chair, consider one with a “waterfall” design at the edge. With a waterfall design, the edge of the seat gradually curves down, which will likely help reduce or eliminate pressure on your legs. As I've mentioned, the seat depth adjustment helps you place yourself in the optimal forward-to-back relationship in your chair, and with your work. If you sit too far forward, this may encourage you to forgo the backrest. Reasons people move forward on their chair include: To alleviate pressure on the backs of their knees or because they lack the height necessary to keep them close to their work when sitting all the way back. So let’s say you are in the habit of sitting forward on your chair, and not using the back of your chair to support your posture. Your hip and back muscles may tighten, and over time you may develop an excessive lordosis, which is a postural misalignment in which your normal low back curve becomes accentuated. With excessive lordosis, you may develop even tighter back muscles or muscle spasm. What if you sit too far back? In this case, the potential for the opposite spinal problem is there. This time it’s likely you're using your backrest, and that’s good. But now, your pelvis may be tucked under (especially true if you don't have a chair back at all) which may, over time, lead to a flat low back posture and/or disc herniation. 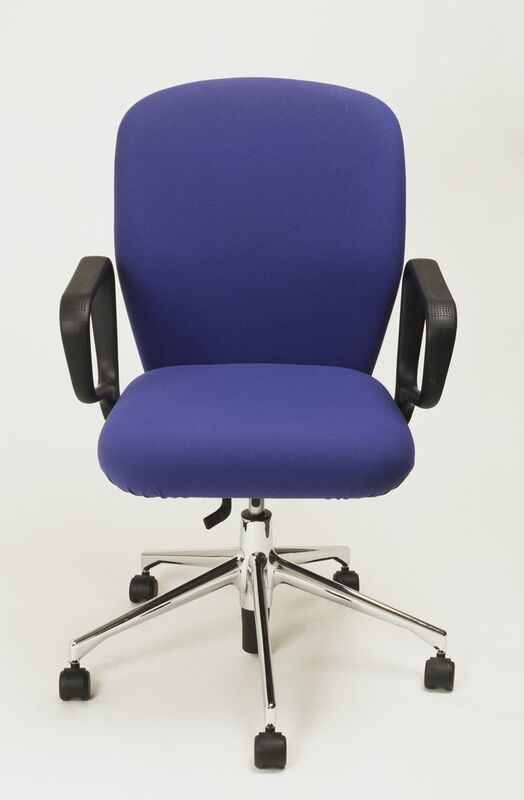 When you purchase your chair, look for seat and backrest material that is padded but not too soft. Ultra soft material is not supportive. Prolonged sitting on a soft chair may require your muscles do double duty. This can lead to some very tight and painful muscle spasms. Along with adjusting your chair so that it supports you while you’re in good alignment, you may want to check out best body practices for sitting. True, chair set-up can be really helpful, but your postural habits play perhaps an even more important role. US Department of Labor. Computer Workstations. Chairs. Washington State Department of Labor and Industries. Office Ergonomics: Computer Workstation & Mobile Computing. Is Your Office Chair Causing Back Pain?